Just like everyone else, my thoughts are moving to Halloween. Time for me to put away the pink for another year. Next up, I wanted to work on a quilt or two dedicated to the Halloween holiday. 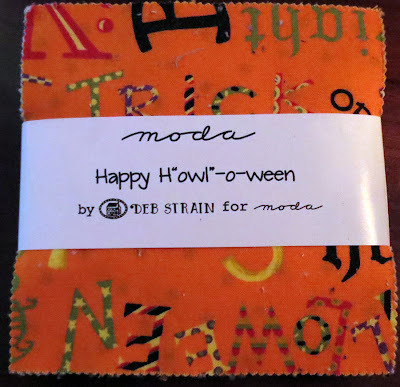 It started with a charm pack of Moda Halloween fabric. I fell in love with all the colors from this little charm pack. I ended up ordering another and was on my way to create a quilt. I knew I had an excess amount of black fabric so I decided to border the blocks in black. 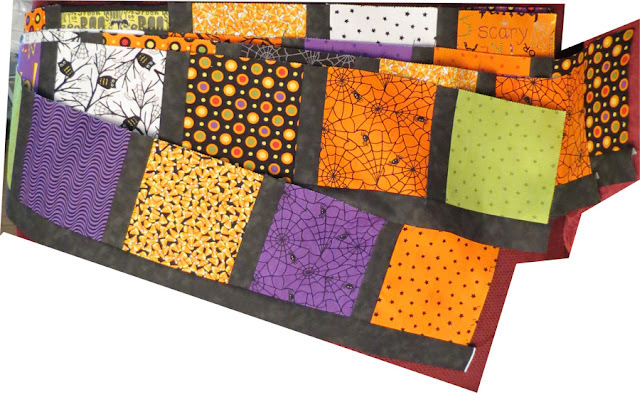 I was 6 blocks short of 100 blocks so I added a few images from Halloween panels I had. Now, I'm up to 10 rows of 9 blocks. My goal is to finish this by the end of the month.